Our Corporate Office is located in South Mumbai at Nariman Point to cater to needs of clients from everywhere. Presently We have two main manufacturing location to cater exports and domestic market. above 25,000 Sq Feet to cater to Western and Southern Region requirements along with Exports. The plant has an annual capacity to process 2.5MTs of polymers. Its State of the Art unit and also has Clean room facility. We have mix of indigenous and imported assets which includes few Italian and Asian machines. In Haridwar our factory is spread across an area above 60,000 Sq. Feet to cater to Northern Region Requirements. The unit has a annual capacity to process 4.5MTs of polymers. The Operations are done under dust free environment. 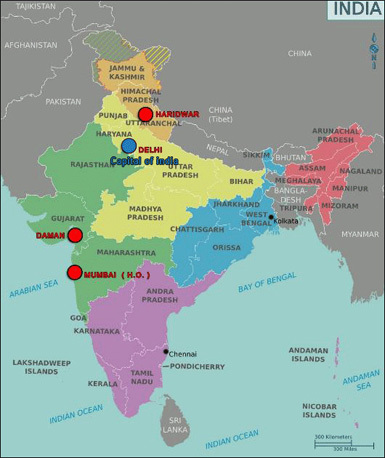 Our unit is situated in SIDCUL which is considered best industrial belt in Northern region. Our unit is in Excise exempted zone. We have our most advanced automated machineries in Haridwar unit which includes Wheel type machines manufactured by Graham Engineering.